Tanzania is the land of safaris _Tanzania safaris include the vast Serengeti National Park, the fascinating Ngorongoro Crater and the wildlife rich Tarangire National Park and not never rules out the diverse cultural encounters like the the Hadzabe people, the last bushmen in Africa to the proud Maasai worriers and also each day slumbering in Africa’s best lodges & Mobile Tented Camps perfectly selected and Tailor made to fit your tastes by our professional experts. 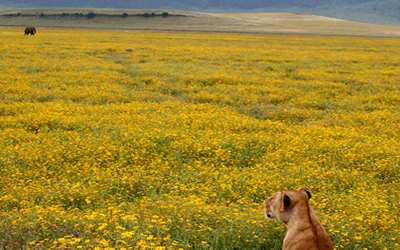 Embark on an authentic Tanzania safari and pause in the famous Ngorongoro Crater, or maybe spectate to the first rays of the morning Golden sun beams reflecting and clearing Mount Kilimanjaro. Remarkably are the sights and sounds of the wildlife-filled and famous Serengeti that signal the bright beginning of a spectacular day with Gorilla Walking Safaris. Traveling with us leaves no trails untouched and absolutely features the continent’s finest and expertly professional local guides, who share countless wonders in Tanzania safaris. Gorilla Walking safaris brings to its customers a combined experience from Uganda safaris to the rest of East Africa and We endeavor to pay attention to detail with flexibility that every safari runs smooth. We pride in our passion & Teamwork doing our best to demonstrate that you are in capable hands through these beautiful lands experiencing the extraordinary. Discover & Embark on an inspirational & authentic Tanzanian safari adventure, watching for wildlife in famous wildlife zones. Be rewarded with an inspirational authentic Tanzanian safari journey watching out for the Big 5 through the lands of safari. Scale to the roof of Africa and embark on an inspirational Big 5 safari & wind up your inspirational trip to the Zanzibar island. 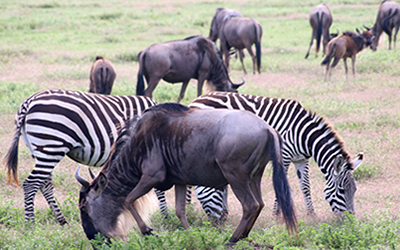 12 Days Great Migration safari. Travel and watch as hundreds of thousands of wilderbeasts & zebras with thier young ones make their annual river crossing in search for food.. Discover with your family on safari the best Tanzania safari destinations. Laugh and bond with family on an extraordinarily 14 days. Spectate to the Finest Africa’s Nature Big concetration of Lions and the great magical spectacle for thousands of millions of Wild beasts & Zebra Migration with their Young ones seeking fresh grass across crocodile fested rivers. Witness the endangered black rhino quietly grazing amidst Thousands of Other vibrant wildlife sheltered in an ancient Crater, a haven for first-class wildlife viewing neighboring the Olduvai Gorge, The cradle for humanity. Ascend to the roof of Africa remarkably Africa’s highest peak, Mount Kilimanjaro, Enjoy a hiking expedition as you experience the extraordinary biodiversity along very spectacular scenic routes. Visit and view millions of flamingos that call lake manyara Home. Lake manyara surrounding regions with pride shelter hippos, impala, baboons and a variety of many bird species.